On January 8, we had the privilege of covering NASCAR Thunder at the Daytona International Speedway for our upcoming NASA EDGE vodcast on the Daytona 500. 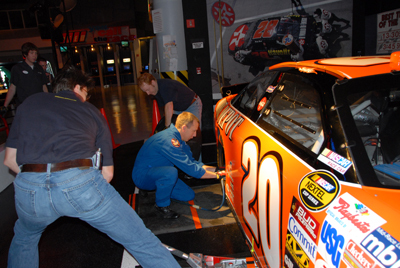 In case you don’t know, 2008 marks the 50th running of the Daytona 500 and it’s NASA’s 50th anniversary. 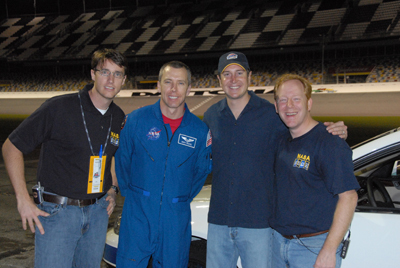 We had the pleasure of working with Astronaut Drew Feustel. He’s part of the STS-125 mission that will service the Hubble Telescope in August. Drew had a chance to meet some of the drivers, pit crews, and hang out with fans at the event. Initially we thought that Drew would not get much attention because how can you compete with the likes of Jeff Gordon, Jimmy Johnson, and Kurt Busch? We were wrong. Drew had his own entourage following him asking for autographs and pictures. Everyone was excited about his upcoming flight in August, especially the drivers themselves. Check out some of these cool pics. Chris, Blair, and Drew change a tire in under 16 seconds. I want to thank Rocky Lind from NASA HQ for setting up this interview for us. 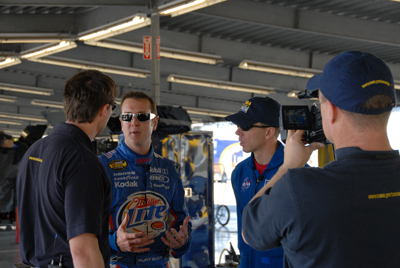 Kurt Busch was very cool to work with, and he was very eager to learn more about what Drew does as an astronaut. We talked about the similarities between a NASCAR driver and an astronaut and the benefits of NASA technologies in racecars. Kurt Busch shows the interior of his car to Drew. 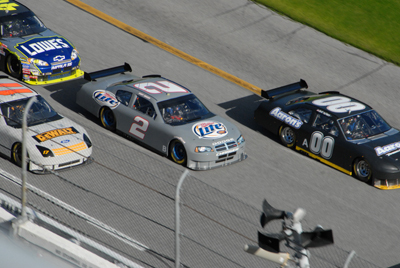 was taken from the top of the Daytona 500 tower. This was the highlight of the day. 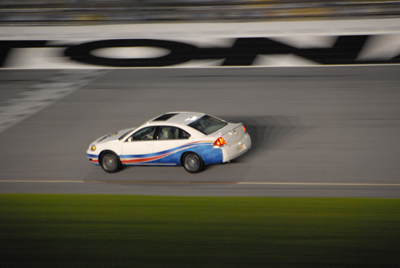 We had the opportunity to ride around the track a couple of times in a 2008 Chevy Impala SS. I’ve never experienced going into a 31 degree banked turn. What a rush! Chris, Drew, Kurt, and Blair pose for a group shot. We’ll be back in Daytona during the Rockfest events the week before the Daytona 500 to finish filming. Blair and I can’t wait to hang out with the public around the NASA Exhibit. If you’re in Daytona on Feb. 12, 13, 15, and 16, come by the NASA exhibit and say hello. I noticed you were changing the rear tire in one of Tony Stewart’s car. Don’t tell Kurt Busch, he may not like that! LOL. I think it’s cool that NASCAR is hooking up with NASA. You guys sponsoring a car? That is really awesome! I have never gone that fast before. I wish I could stick my head out of a car going that fast! That would feel really refreshing! Hehehe! But, I never knew that NASA and NASCAR was that close. 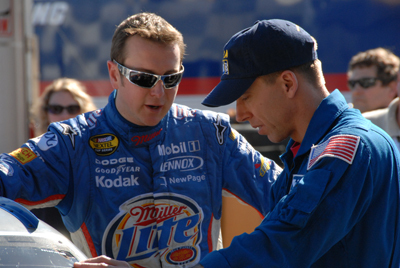 I also woudln’t think that astronauts would be well known in NASCAR games. I hope to see the new podcast soon. I never knew that NASA and NASCAR was that close. I think its wonderful you guys are sponsoring a car.